Welcome to the Tavern of the "Cleaved Maiden“! Soon you'll find here an overview with links to short stories around the world of Gothic 4. These stories tell you something about the country and it's people, happenings that are true or maybe just rumours. Stories like you hear them in taverns. This series of short stories firsthand from the developers will be continued at regular intervals in different media until the release of Gothic 4. The links to every single story can be found here. 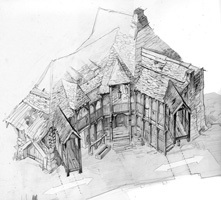 The Cleaved Maiden is a tavern in South Stewark. It is located at the edge of the orc forest, where the old trade route connecting Stewark with Setarrif to the east and Tooshoo to the south forks. A visitor to the Maiden looking out of the window from the upper stories or through the gaps in the rotting timber fence has not only a good view of the dark forest, but also of the swirling sea crashing against the western shores of Argaan. 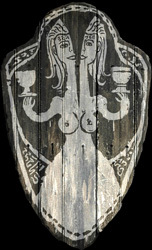 The name of the Cleaved Maiden’s landlady is Murdra. She is corpulent, stout, surly and rough; a middle-aged woman you don’t want to cross. One day, when the Maiden was still called the Tiller’s Rest - a name picked by the husband, and profoundly disliked by Murdra – she was wandering through a field of rubble beyond the Valley of Blood. Among the rubble, she discovered an ancient, weathered statuette. The details had faded away long before – all she could make out was a woman whose head was split down the middle. After examining the statuette for some time, Murdra had an epiphany: this was a maiden who got her head cleaved in twain with an ax. That ought’a attract a few customers, Murdra thought and headed back to the tavern, determined to send the Tiller to Beliar. Her husband conceded after a good tongue-lashing (who cares what he thinks anyway), and soon the tavern had a proper name – at least if you were to ask Murdra. News from the "Cleaved Maiden"
In the future, the Spellbound website (www.spellbound.com) will announce a short story playing in the Cleaved Maiden on at least once a month. This story will be published on one of the Arcania – A Gothic Tale websites. The first part printed here introduces the Cleaved Maiden and its landlady Murdra. 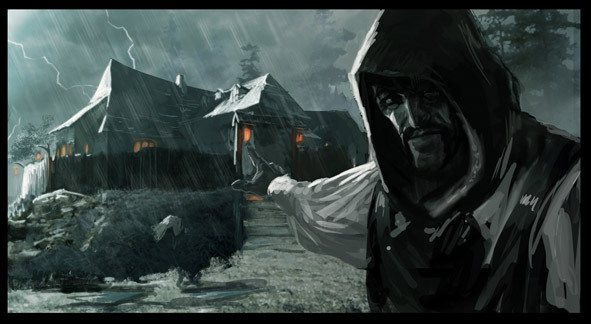 The following tavern stories will slowly reveal what happened in the ten years between Gothic 3 and Arcania – A Gothic Tale. Readers will get to know many characters they will later meet in the game; starting with Murdra, the landlady of the Cleaved Maiden. We get to know something about the landlady and her guests and we almost hear a newsbit about Xardas and the events at the mainland. Political intrigues and complications culminate in a murder in the tavern. A knife, missed by Murdra, figure. A battle take place near of the Cleaved Maiden. The tavern become anchor for refugees. There are new rumors from Myrtana from an unnamed hero. But what's true and what not? The king and his entourage come after a hunting trip to the tavern, but the bag hazard all. News about Rhobar III. and Thorus from Myrtana. Murdra's husband Belgor quarrel with his peg leg. A stranger comes to the tavern. But the experiences of the past seems to overwhelm him. Excitement at the Cleaved Maiden: Armed Orcs are in the yard. And by them is a dark warrior. A new boy in the Cleaved Maiden and a tragic accident provides for changes. Pad's story and the death of Belgor are revealed. An attack of the Myrtanians is impending. The Cleaved Maiden Inn is in the thick of it. Hostile forces attack the Cleaved Maiden Inn, but two well known friends are on the spot.